Classic 2 piece Alice in Wonderland costume specially tailored to flatter a plus size figure from 1X to 4X. 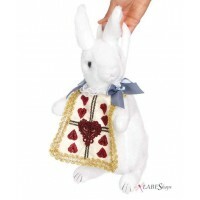 This Classic Storybook Alice in Wonderland costume includes the blue dress with apron and fun checkerboard back accent. Comes with the black bow headband. Item Number: LA-c85355X | Approximate Size (Inches): 10.00 wide x 2.00 deep x 14.00 high | Approximate Shipping Weight: 2.00 lbs.